The 2011 MotoGP season enters its second half this weekend at the Mazda Raceway Laguna Seca, where the Red Bull US Grand Prix follows a Sachsenring round which narrowed the gap further at the top of the Championship standings. 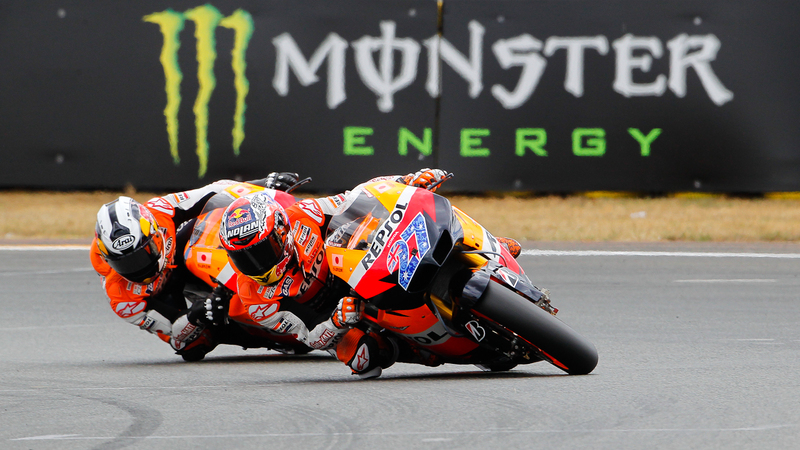 Round 10 promises to be as entertaining as Germany, where Dani Pedrosa took victory in only his second race back from injury and Jorge Lorenzo chipped further away at Casey Stoner’s advantage at the top of the standings to get within 15 points of the Australian at exactly the halfway stage of the season. Laguna Seca will offer a fantastic setting for another thrilling weekend before the premier class breaks for almost three weeks ahead of the Brno round, and with home interest in four riders adding to a close Championship fight the scene is set perfectly for a MotoGP centrepiece with neither the Moto2 or 125cc categories in action. Stoner remains the man to catch in the premier class and with third place in Germany he recorded a seventh straight podium finish, his longest sequence of rostrum results in GP racing to date. The Repsol Honda rider is being hotly pursued by defending World Champion Lorenzo however, and it was they who formed the one-two across the finish line last season as the Spaniard took his sixth win of the 2010 campaign. Third in the Championship is Andrea Dovizioso (Repsol Honda), who has twice come close to a podium finish at Laguna but is yet to finish inside the top three there. At 21 points behind Lorenzo the Italian’s motivation will be as high as ever, as will that of compatriot Valentino Rossi. The Ducati Team rider finished on the podium at Laguna last year in only his second race back after breaking a leg, and currently sits fourth in the Championship heading to a circuit at which he took a famous victory in 2008 following a battle with Stoner which has become one of the most memorable of recent years. Dani Pedrosa’s return to the fold was confirmed in spectacular style in Germany, where the Repsol Honda rider took victory in only his second race back following injury. With his second win of the season Pedrosa became the rider to have won the most premier class races (14) without having yet taken an elite category title. His victory also levelled, once again, the number of wins that Honda and Yamaha have achieved in the four-stroke era (65 each), and also made it a fourth different rider to have won a race in the last four rounds of the 2011 season. Leading the home charge in front of a patriotic American crowd will be Ben Spies. The Yamaha Factory Racing rider, who at Assen took his first MotoGP victory, will hope to add to the seven American riders who have taken World Championship wins at Laguna in the 12 premier class races which have been held there. It has however been five years since a home rider stood on the podium at the track, Nicky Hayden being the last man to do so when he took victory in 2006, and the Ducati Team rider will join Spies in his desire to record a memorable result. Likewise Colin Edwards (Monster Yamaha Tech 3), who has a best result of second (from 2005) at the track will be highly motivated on home soil, and Marco Simoncelli (San Carlo Honda Gresini) will continue his search for a first premier class podium at a track he experienced a less than favourable introduction to last year. Rookies Karel Abraham (Cardio AB Motoracing) and Cal Crutchlow (Monster Yamaha Tech 3) will race at the circuit for the first time, as will Hiroshi Aoyama (San Carlo Honda Gresini) who missed last year’s round due to injury in his first premier class campaign. Héctor Barberá (Mapfre Aspar) is in line to make his 150th Grand Prix start across all categories this weekend, whilst fellow Spaniard Álvaro Bautista (Rizla Suzuki) will be buoyed by a stirring display put on in Germany. Toni Elías (LCR Honda) continues to seek an upturn in fortunes in his 2011 season, as does Pramac Racing’s Randy de Puniet whose fellow Frenchman Sylvain Guintoli remains on standby to substitute for Loris Capirossi – as he did at the Sachsenring – if the Italian has still not recovered sufficiently from injury. There will also be a special wild card entry this weekend, with American rider Ben Bostrom on an LCR Honda RC212V alongside Elías. The Red Bull US Grand Prix gets underway on Friday at 10.10am local time, when the MotoGP bikes take to the track for the opening practice session of the weekend.